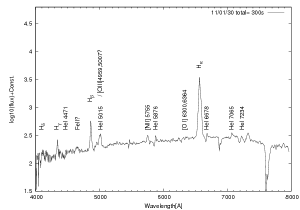 We update our spectra of V5578 Sgr. 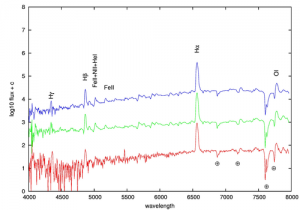 Emission lines are gradually evolving. 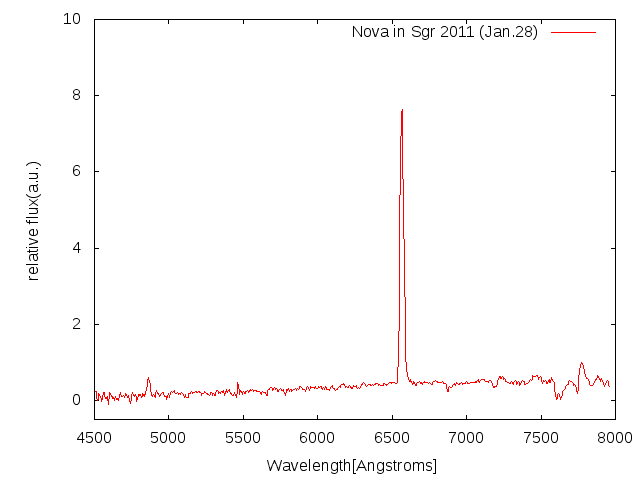 We found that intriguing features in spectra of V5587 Sgr (Nova Sgr 2011). 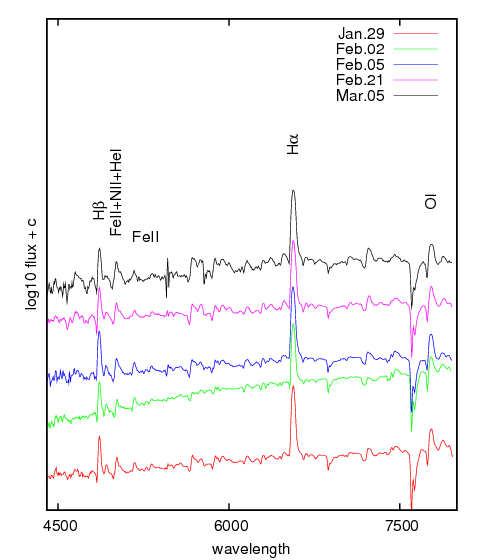 It showed a re-growth of absorption components in P-Cygni profiles for H-beta and other lines on 21 Feb. 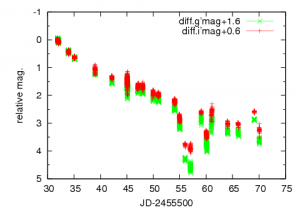 These features are often observed when rebrightening events of classical novae (Tanaka+2010). 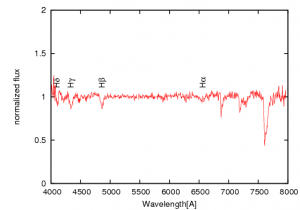 We continue observations of this object. 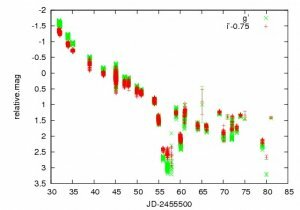 We performed spectroscopic observations of SDSS J133941.11+484727.5 on Feb. 9 (UT). 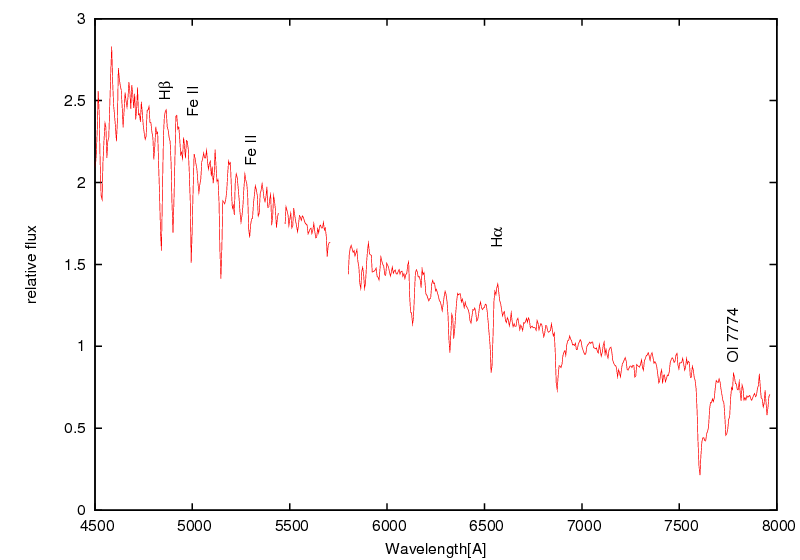 Our preliminary spectrum is shown in the figure. 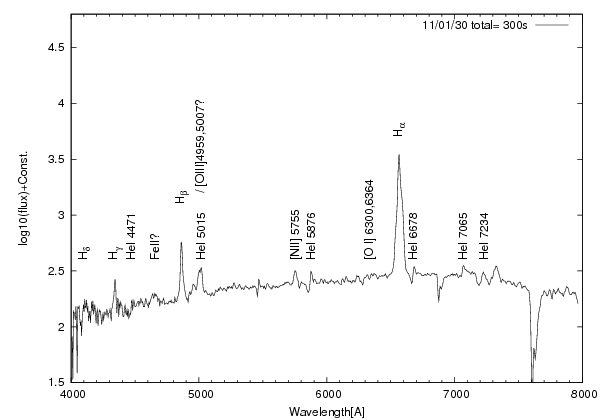 The prominent H-alpha emission exists in its absorption component. 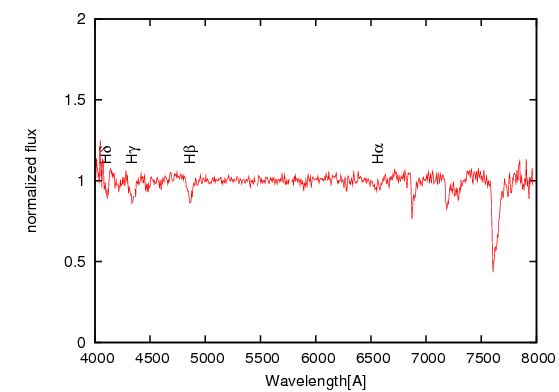 Bload absorption lines are shown for H-beta, H-gamma, H-delta and He I (4471A). 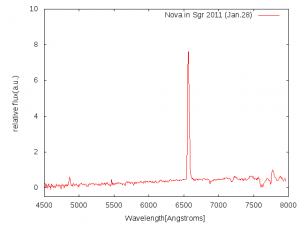 These spectral features also indicate that the object is a dwarf nova as already reported in vsnet-alert 12807, 12816, 12817. 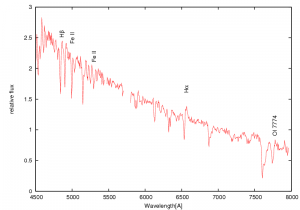 The Bowen complex of NIII, CIII are possiblily detected, but He II (4686A) is not seen in our data. 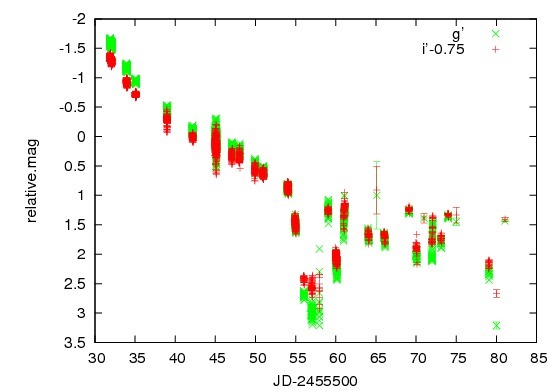 These lines are observed during outbursting phase of well observed WZ-Sge stars, WZ Sge, GW Lib and V455 And. 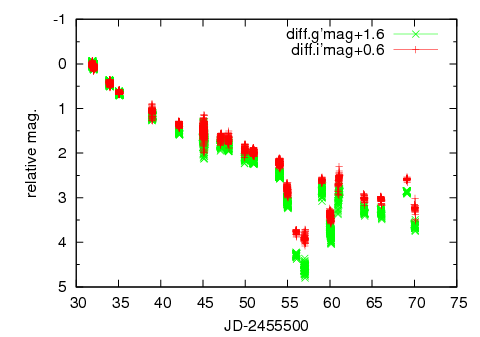 Temperatures of excited region of SDSS J1339 might be lower than those in them. 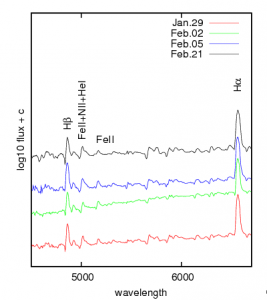 We continue time-resolved observations of this dwarf nova. 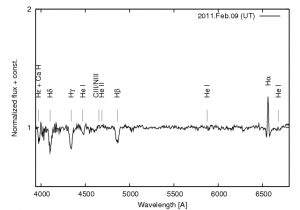 We start spectroscopic monitorings of V1280 Sco in the season 2011. 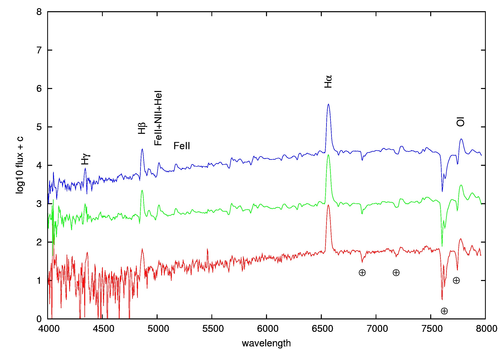 The Balmer, He I and [O I] emission lines still remain strong on a strong continuum emission as observed in the last summer. 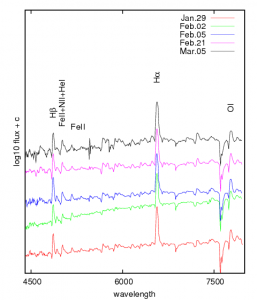 These indicate that the nova wind is still strong. 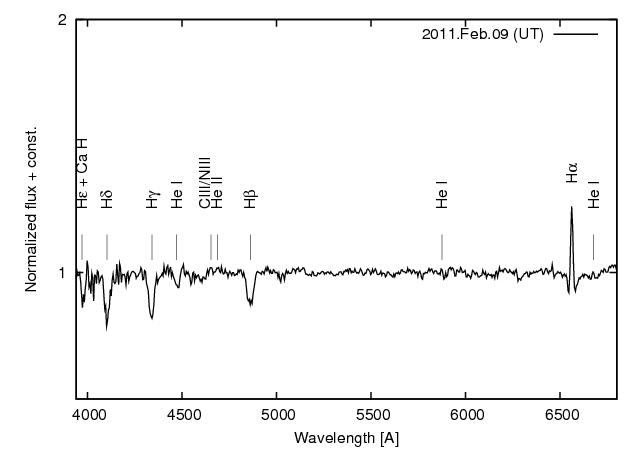 We update spectra of Nova Sagittarii 2011. 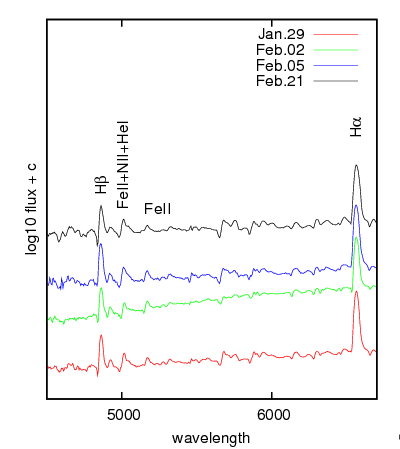 Fe II emission lines were detected on Jan.29, 30.